From all the marketing puff coming out from the Paris show anout the EQC it looks to me as if mercedes is about to go electric or hybrid in a serious way. The recent IPCC report is rightly shaking things up big time here in europe. So i do wonder whether the model revisions will be slightly longer than usual. Mercedes have opened a new battery factory in germany to meet their needs. i am at the start of a 3 yr lease and very happy with the car. I a may wait at the end of the lease if need be and go electric next time assuming the puff turns into reality and a car akin to my e estate is available. And MBUSA has just broken ground on a battery manufacturing plant in Alabama. Different strokes...huh??? I am looking forward to touch screen and improved voice commands when MBUX replaces COMAND. I do believe there are alternate methods, so you may not actually have to touch the screen. What improvements to voice commands do you want? I can do just about everything I need via voice. The MB voice is superior to BMW which most often misunderstood my commands. Yes, Voice is good now, I use it often. MBUX adds Siri or Alexa like functions. Link below is lengthy. For a short version just watch the last 1 minute. I wonder what the members here who said they’d never give a dime to Audi or VW think of this. What about giving more money to MB? My understanding is that the testing I mentioned was done at a VW AG facility and the data was shared to MB and BMW. If MB were to acknowledge animal testing then I wouldn't consider purchasing one. I won't support any organization that abuses innocent animals for any reason. That answer your question? Agreed. VW founded the studies, the data was shared with Mercedes and BMW. All should be ashamed, but VW was the most responsible. I am not happy about animal testing so it leaves me feeling unhappy daimler have taken this route......i am not bothered about the human element given the test was conducted in germany where it is less likely those involved had no options but to participate due to economic disadvantages. Sorry to offend but had it been outside of europe where there are many countries with less developed social support i might be more concerned. however i see this as a different issue to vw's deliberate cheating on test results by installing the defeat software that was a calculated decision to lie and cheat. All products have to go through r&d and sadly animal experimentation is regrettably still relied on. I would like it to stop and i shall consider what i can do to make companies like daimler aware it is unacceptable. I read a different article that suggested VW was the spearhead for this. It is distressing that any of them were involved in animal research. Appalling as a mater of fact. Still what VW AG did by programming systems to provide false emissions is what would prevent me from ever buying a VW product. 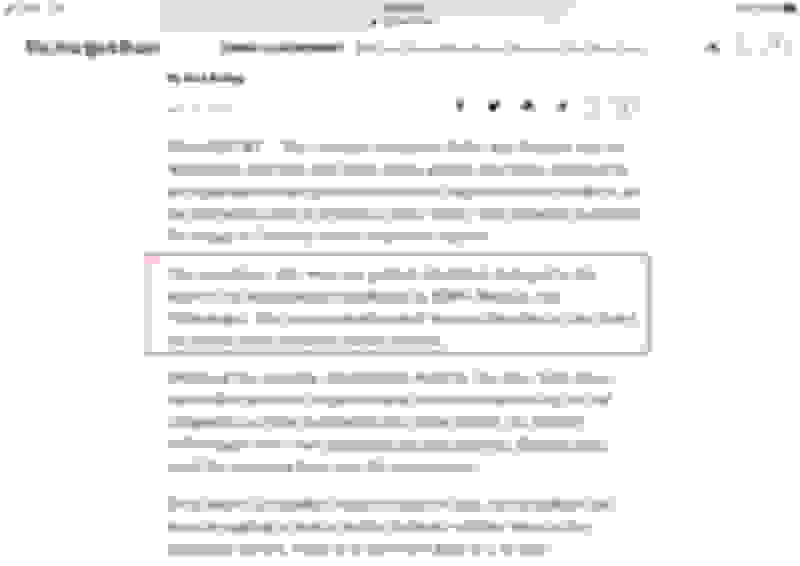 Last edited by rbrylaw; 10-14-2018 at 10:16 PM. That article doesn’t show VW as being more responsible. 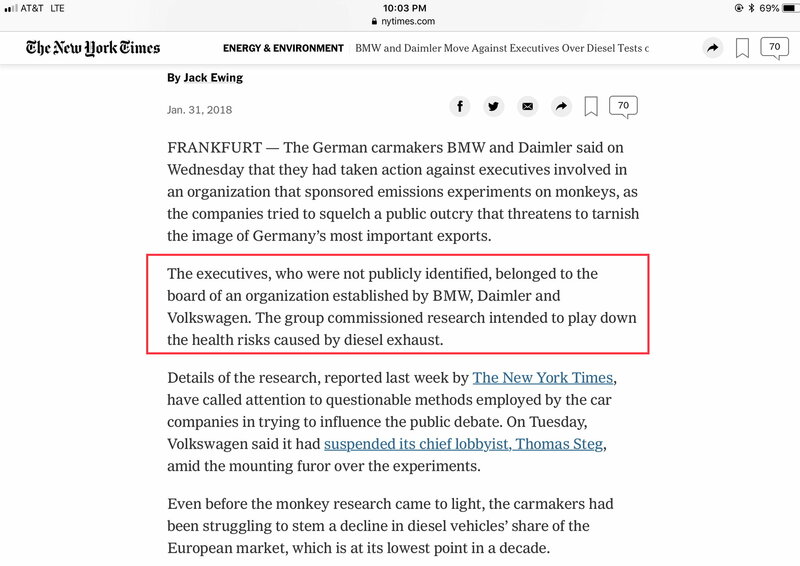 And The NY Times article is different from the one I posted and also states all 3 automakers as being involved in creating the testing organization. Though the monkey testing was reprehensible, it was not illegal. The VW/Audi/Porsche cheat software was illegal. That is why I will never purchase their vehicles or other products. Again, I've made it clear the animal testing is Reprehensible. Awful. Atrocious. It's the knowingly illegal software to hide the true emissions that makes me never want to buy any of their products. Sad to say, but there are many many products that we use and routinely purchase that likely came to be after animal testing. As ua suggests, it may be an awful thing to do, but it's not illegal. And I'm glad VW, BMW and Mercedes will no longer have any involvement in such awful testing practices. Last edited by rbrylaw; 10-15-2018 at 10:01 AM. By law every pharmaceutical must be tested on non-human animals before clinical trials can commence. Boy, this thread really jumped off the rails. I came from a 2014 S6 to my 2018 E43, and I've had mixed thoughts. There are some things I miss about the Audi. I think the build quality was honestly better in the Audi, and so was the ride quality. The tech and especially the distronic is way better in the Mercedes. But I'm peeved I had to get a third party OBD unit thing to unprogram the auto start-stop. Also peeved about no spare tire. I'm having non run-flats put on my car this Tuesday (DWS 06's) so hopefully that will improve comfort. But still... part of me misses the S6. It felt bigger and certainly looked bigger. The A6 / S6 is a beastly automobile. On first glance you can't tell a C from an E anymore with MB. The S is sizable enough to notice. But on the topic of this emissions stuff, if you think Audi were the only ones doing this, then I've got a bridge to sell you. Audi and VW were the ones who got *caught*, but I can pretty much promise you, things like this become industry-wide. I wouldn't base any of my buying decisions based on things like the emissions scandal. It has jumped the shark a bit hasn't it? I find the argument of illegality being the end all a bit odd. If you see someone drop money on the way to their car and you scoop it up and walk the other way, it's not illegal. If you see a child who has fallen into the water and can't swim, but you can, it's not illegal to keep walking. Many examples exist, but if the bright line you have is solely regarding statutes period, well it's just a viewpoint I cannot accept. I find the argument of illegality being the end all a bit odd. If you see someone drop money on the way to their car and you scoop it up and walk the other way, it's not illegal. In many jurisdictions this is illegal. There are several court cases where such assets were not returned to the owner resulting in prison time for the offender. If you see a child who has fallen into the water and can't swim, but you can, it's not illegal to keep walking. Again the legality of withholding lifesaving aid varies by jurisdiction. But just out of curiosity and by no means am I INSTIGATING in any shape or form. For those that are strongly opposing animal testing, are you guys vegetarians as well? Are we opposing all types of animal testing or something at the level of the VW related testing? (tbh I haven't really read into it fully yet). Once again, just curious, not starting any trouble. Its just that the level of ethics and morals varying from one individual to another can be so different.. I'm not a vegetarian and likely most here aren't. Chances are like me, many here eat chickens and cows and other farm animals, as well as fish and other fish that swim in the oceans, rivers and streams. We don't eat highly intelligent Macaque Monkeys, nor do we torture them by making them breath noxious fumes for months on end and then dissect them to see what effects those noxious fumes had on them. There are limits and they crossed them. If your line is legality then I have to say that is sad. There is a wrong and right which has nothing to do with laws. It is based on our humanity more than laws. Consider this, in **** Germany from 1933 to the end of the war a German citizen could abuse or murder any jew or pole etc. without anything legally being done to them because according to the state and thus the states laws they were sub-humans. Those actions were not illegal yet they are disgusting by any 'normal' human beings moral compass. I guess you missed my point, or just ignored it. Let me know the statute that requires me to jump in after someone please, or one requiring me to return lost money. I agree with fleuger above too. We’ve even had a lot of atrocious things here in the US that were perfectly legal. haha at the end of day, it just seems like it comes down to if our actions are justifiable or not. Guess ethics is one thing, what you do about it is another.